A "completely" inserted SD memory card with "correctly" installed operating system. A "suitable USB power supply" with 5 volts and at least 2 amps output current. Note: Whether Raspberry Pi really starts up without problems or not, can only be determined beyond doubt, if you have turned on an HDMI screen before commissioning and connected. If you do without it, for example, because of headless operation, then you will hardly get the problem on the track, if no connection via the network is possible. You can only find the problem if you look at a screen where Raspberry Pi is standing. It must be remembered that a Raspberry Pi usually only activates the screen output on the HDMI output if it can recognize a connected monitor when starting up. If a screen is connected after commissioning, it usually remains off. The reason is that Raspberry Pi does not "activate" the HDMI output afterward (no Plug & Play). If no screen output is possible, then one must rely on the correct interpretation of the LEDs on Raspberry Pi. The (red) PWR LED normally only signals an existing power supply. That is, whether the power adapter is plugged in or not. Even with a shutdown Raspberry Pi, the PWR LED should still be lit. If the PWR LED flashes, this indicates a problem with the power supply. For older Raspberry Pi models, this LED flashes when the voltage drops below 5 volts. From Raspberry Pi B +, the PWR LED flashes only when the voltage falls below 4.63 volts. If the PWR LED flashes then the power supply is the problem and needs to be replaced. If the PWR LED is on and the (green) ACT LED is also permanently on or off, the image on the SD memory card could not normally be read. The same effect is synonymous if no SD card is inserted. Problems when starting the operating system will signal Raspberry Pi with the ACT LED. In that case, this LED will flash several times and then stay off. In any case, something is wrong with the image or the SD memory card. Normal is when the PWR LED is permanently lit and the ACT LED otherwise indicates accesses to the SD card. In that case, the ACT LED will flash violently. Both when reading and when writing to the SD card. To track down a total failure, it only helps to replace all parts in turn (not all at once) with parts that you know work well. But beware of new parts. They can also be broken. If the culprit cannot be restricted in this way, then you should also take a look at the following parts, if they exist. Usually, a Raspberry Pi does not break that easily. Therefore, you should expect that some SD memory card makes problems. Especially when booting it can then come to a variety of problems. Occasional incompatibilities or structural issues can cause contact between the card and the slot to be missed. In general, it can be assumed that the SD memory card used is OK. If in doubt, check compatibility with another Raspberry Pi here. The feature in a completely different device does not guarantee that the card will work in Raspberry Pi. Otherwise, the question arises how the operating system was placed on the SD card. If you have a Linux PC and there insert the SD card, then you should be able to recognize two partitions on it. If you only have one Windows PC, you only see one partition named "Boot". In both cases, everything should be fine. If one does not see this partition, then the installation of the operating system was faulty. 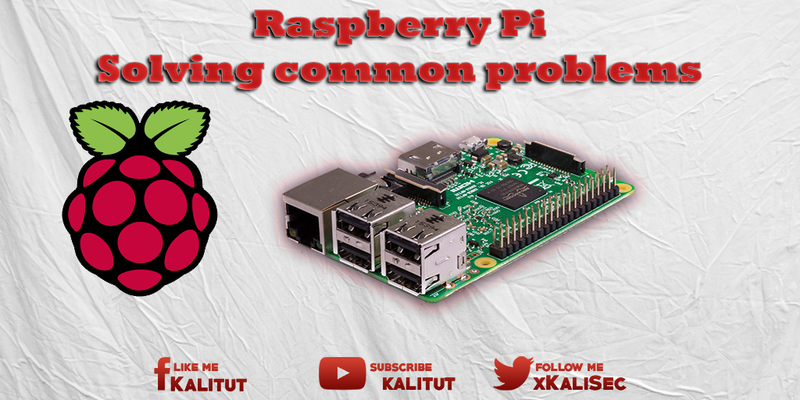 During continuous operation, you notice that Raspberry Pi is not working properly anymore. He seems to crash unpredictably or get stuck. The failures of Raspberry Pi are often expressed by the fact that network connections (LAN, WLAN, Internet) are lost or USB devices (keyboard, mouse, USB sticks, ...) stop their service completely or sporadically. In general, then only helps a restart. That is, unplug and plug in again. As a rule, you will just notice that Raspberry Pi is not working properly and is working very unreliable. The exact cause can be very diverse. An unsuitable USB device is enough. For example, an additional wireless adapter that draws heavy current. Or a USB hard drive that actually needs its own power supply. Sometimes you can see in the train of failures or instabilities that sometimes a colorful square (rainbow colors) appears at the top right of the screen. The square indicates that the power supply is insufficient. The square appears as soon as the input voltage drops below 4.65V. This square can also appear completely unmotivated at 4.9 volts. If the square only lights up red, then the chip has become over 85 ° C warm. Cause can then be the overclocking, which much more power is drawn. As soon as the square appears, the overclocking will also be switched off. The power consumption of the internal components is well documented and optimally adjusted. Here you get out with a standard USB power supply. The power consumption of USB devices, however, is unknown. Here it can happen that a commercially available USB power supply proves to be unsuitable. According to the USB specification, a USB device must be able to output its maximum power consumption. The following command can be used to display information about the currently connected USB devices. The information is of course to be treated with caution. Because they do not mean that this power is actually needed. This is usually a problem with the power supply. Despite a 5V / 2A USB power supply, some power supplies are simply unsuitable for powering a Raspberry Pi along with multiple USB devices and LAN / Wi-Fi connection. It is not about the values of the power supply alone, but how stable the power supply can deliver these values in a certain state. The amperage consumed varies considerably. A power supply not only has to be suitable for Raspberry Pi, it has to cope with the frequently changing power requirements of the connected peripherals. That can not afford every offered power supply. Note: Even a power supply that has been used for a long time and has never caused any problems can get bad electrical values due to age, which in turn can lead to unstable conditions. A first sensible measure is to replace the USB cable between the power supply and Raspberry Pi, if replaceable. Not every USB cable is equally well suited for the power supply. If the cable is over 1 m long, then that's borderline. Especially with thin cables, the line resistance is too large and thus the voltage loss too high. Sometimes it helps to use a different and above all short cable or if that is not possible to make one yourself with a larger cross-section. Unfortunately, most of the USB power supplies that are available, some of which are included with Raspberry Pi bundles, are totally inappropriate. They are suitable as a charger for mobile phones and smartphones, but less for the power of a mini-computer, such as Raspberry Pi. Especially not when its USB ports still several other devices are connected. Raspberry Pi needs a power supply that is able to keep its output voltage constant even when a lot of power is drawn at short notice. The power supply must be able to respond dynamically to short-term changing power requirements. In general, a larger power supply (in amps) will help to power a Raspberry Pi permanently and stably. At the same time, the colored square on the top right of the screen disappears. USB devices typically draw their power from the USB ports on Raspberry Pi. This power must come from Raspberry Pi's USB power supply. This can cause either the power adapter or Raspberry Pi to steal. If you want to operate USB devices stable on Raspberry Pi, then it is recommended to operate it on an active USB hub, which has its own power supply. Then you have to live emergency with 2 power supplies. However, there are also power supplies with 2 or more USB jacks, which can also provide more power at the same time. Note: This solution only makes sense if you use a really good power supply. Otherwise, this solution will cause more problems than it will do. By default, the current drain from the USB ports is limited to 600 mA. Overall, Raspberry Pi may pass 1.2A (1200mA) to the USB devices. This is only possible if the power supply is powerful enough. In addition, this must be explicitly enabled. With Raspberry Pi together with Raspbian it is possible to increase the current, which can be taken over the USB, from 600 mA to 1200 mA with the models B + and 2 B.
Overclocking has the disadvantage that it also increases the power consumption. An otherwise functioning power supply may turn out to be unsuitable if you want to overclock your Raspberry Pi. As a short-term action, you can turn off the overclocking feature to get to the bottom of the problem or to bridge the gap until you have a better power supply. After the call you get to see the main menu. There you select with the arrow key "Overclock" and press "Return". Then you can turn off the overclocking. Normally, an SD memory card with 8 GB is sufficient. Because memory cards with more storage cost only slightly more, many users use 64 GB memory cards. It is important to know that SD cards consume the more power the larger the capacity of the memory card is. If you then want to run one or even two USB flash drives on Raspberry Pi, then this can be problematic. In this case, you need to use smaller USB sticks and memory cards, or operate the USB sticks via an "active" USB hub with its own power supply.